Learn how to relax your mind and body in simple steps that are easy to apply to everyday living. Includes short mindfulness exercises to incorporate into your day-to-day. Three guided meditations teach you how to relax the body’s autonomic nervous system with easy relaxation techniques. In today’s fast moving world, where sensory and information overload is the norm, learning how to manage the Stress Response helps you avoid physical and emotional burn-out at work. 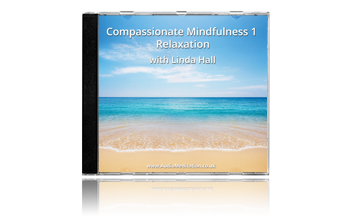 ‘Relaxation’ is the first in the series – ‘Compassionate Mindfulness’: a collection of deeply relaxing guided meditations, combined with simple everyday exercises. Showing how living mindfully and with self-compassion acts as a powerful antidote to modern day stress, and supports health and wellbeing generally. This album focuses on how to self-moderate the nervous system’s ‘Stress Response’, (otherwise known as fight, freeze, or flight). Many of us are caught in a chronic state of ‘flight, freeze, or flight’ – the body’s primal automatic response to perceived danger. Different things cause the body to react in this way, such as anxiety, working too hard, over-stimulation and even over excitement. Left unaddressed for too long, this can lead to burn-out, depression or general anxiety disorders. ‘Relaxation’ shows you how to sit back from things, ground yourself and release tension in simple ways that can be easily incorporated into your day-to-day routine to break the vicious cycle of stress. Each meditation track on this album is followed by a short track suggesting how to easily incorporate what the meditation has taught you into your everyday life.